Located at 881 Oliver Street in North Tonawanda, the East Avenue Tavern is across the street from the former Buffalo Bolt Works division of Buffalo Forge. 881 Oliver Street in Tonawanda has been in existence for over 100 years. The present owner is Leonard Wudyka, a former Alderman in North Tonawanda , who has owned it since September 1976. His father, John Wudyka, and uncle, Martin Wudyka began business in 1944, purchasing it from Frank Rotko. It is believed to be one of the oldest existing taverns still in operation in North Tonawanda. 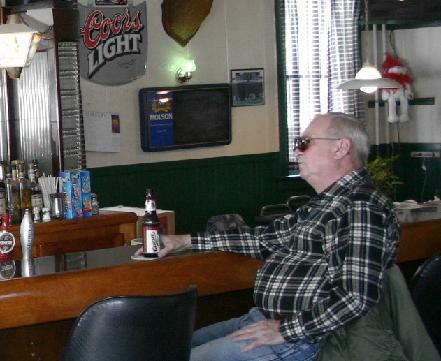 I am proud to announce that the East Avenue Tavern is the winner of the 2005 BINIASZ.COM “Classic Tavern” award. The business ranks high in all “classic tavern” criteria including fully restored art deco back bar, the working man’s Genesee Beer on tap, men’s room up front, dinning area (for Friday Fish) in the rear.